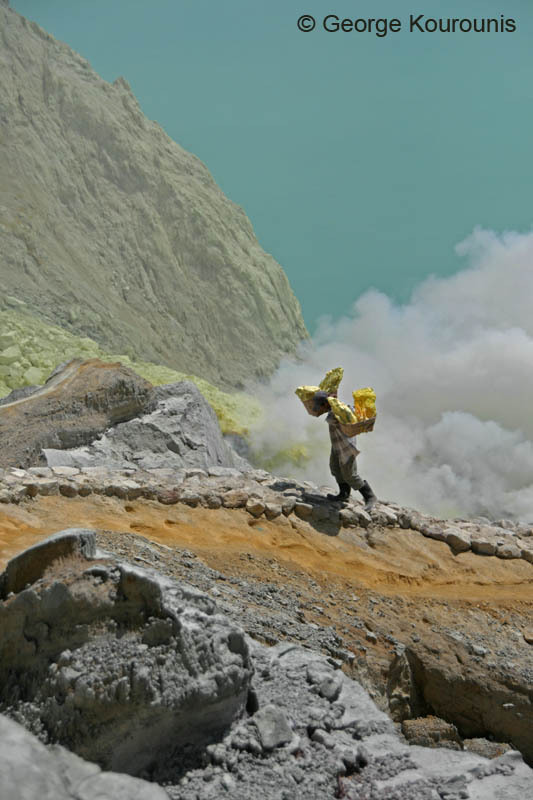 Kawah Ijen is one of the most incredible and surreal places. It's the site of a labor intensive sulfur mining operation where miners collect and carry huge loads of pure sulfur up from the crater floor along a steep, rocky path amid clouds of sulfur dioxide gas, all for the equivalent of about ten dollars a day. 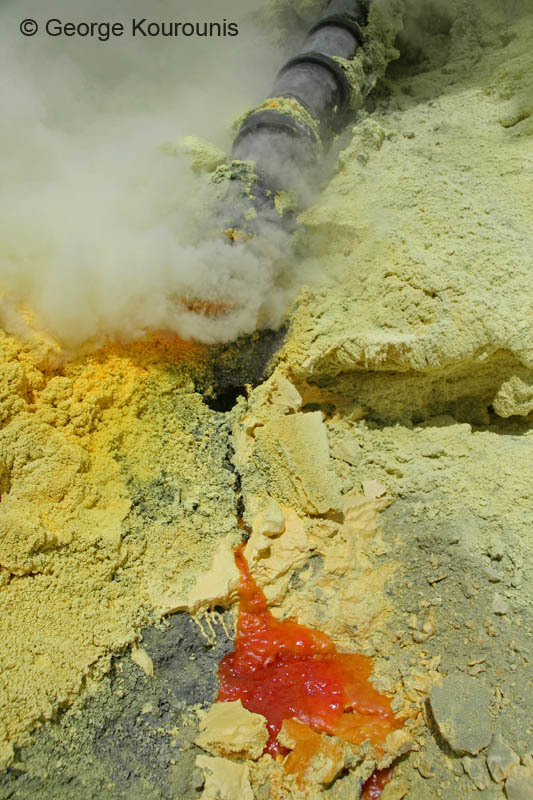 It is also home to the largest lake of sulfuric acid in the world. George Kourounis wanted to explore this volcano in the most extreme manner he could think of... By taking a small boat out onto the acid lake. The ph of the lake water is 0.5, similar to the strength of car battery acid. The sulfuric acid lake in the middle of Ijen crater. Not exactly the perfect spot for a boat trip. As soon as I put this aluminum can into the acid, it started to sizzle and bubble. After about 20 minutes, the metal had been eaten away to the point where it was as thin as tissue. Out I go. I was confident that the rubber would survive the acid but I did have my doubts about the seams and the metal paddles. Out towards the middle of the acid lake. If I ran into problems out here, the consequences could be serious. Measuring the acidity. The ph was 0.5, about the same as the acid in a car battery. I had to return to shore when acid dripped into the boat from the paddles and started to burn my legs. Once ashore I used a knife to cut away my acid soaked pant legs. Looking down from the craters edge onto the sulfur mine and acid lake. 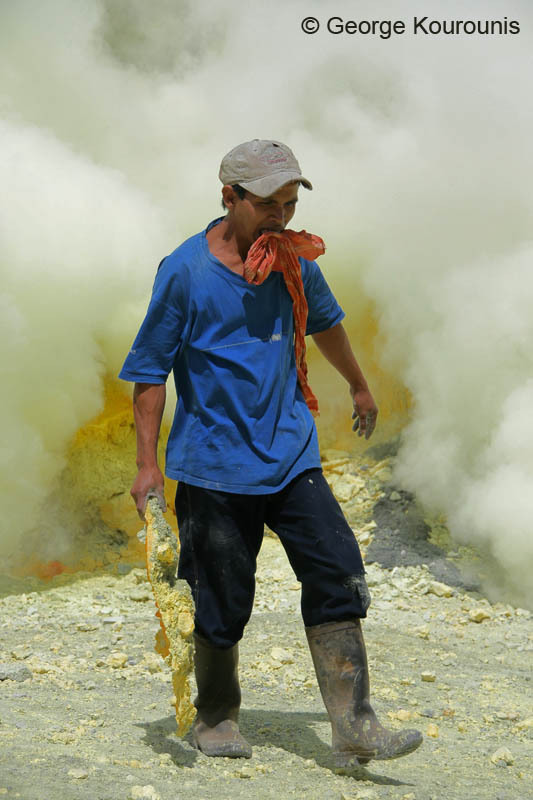 A miner hauling a heavy load of sulfur up from the crater. These miners carry 65 to 100 kg of sulfur at a time. The sulfur dioxide gas at the mine site is so strong that I had problems breathing at times even with a gas mask. The miners who work there every day use only a wet rag to breath through. It may be pretty, but this is one of the harshest work environments in the world. The sulfur mined here is mostly used in the processing of sugar on Java. The workers install long pipes into the fumaroles to collect the hot, liquid sulfur which drips out and solidifies as it cools. They break off huge chunks with a crowbar and haul them out by hand with no protective equipment. The wet rags in their mouths help against the gas but it ends up dissolving their teeth eventually. A miner braves the noxious gas cloud that drifts around the crater. Almost to the top... These workers make the 4 km trek up out of the crater and down to the base of the volcano about twice a day. And you thought your job was tough! I tried carrying one of the baskets and it was so heavy that I could only walk a few dozen paces. These guys carry them up the steep slopes of the crater!